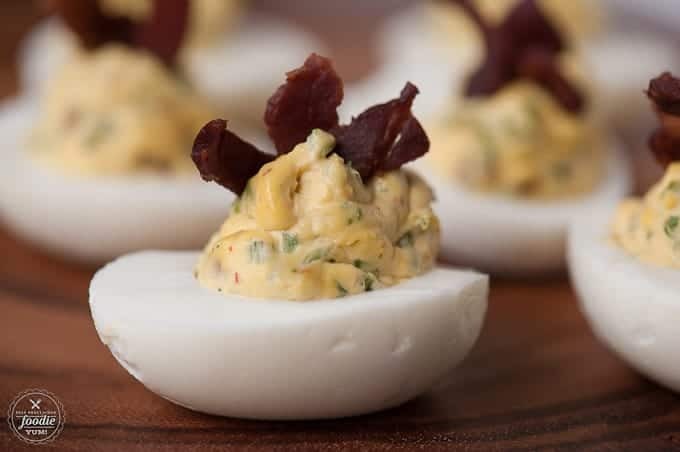 Bacon Jalapeño Deviled Eggs are a spicy two bite appetizer that people love, especially as game day grub or during a party. My husband loves deviled eggs. He always begs to make them. I’ve had a life long battle with not properly being able to make a hard boiled egg. I succeeded this time, but they still aren’t completely pretty, but man did these taste good. 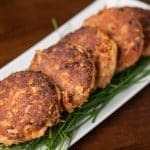 These are really simple to make and only take two additional ingredients – bacon and fresh jalapeno. 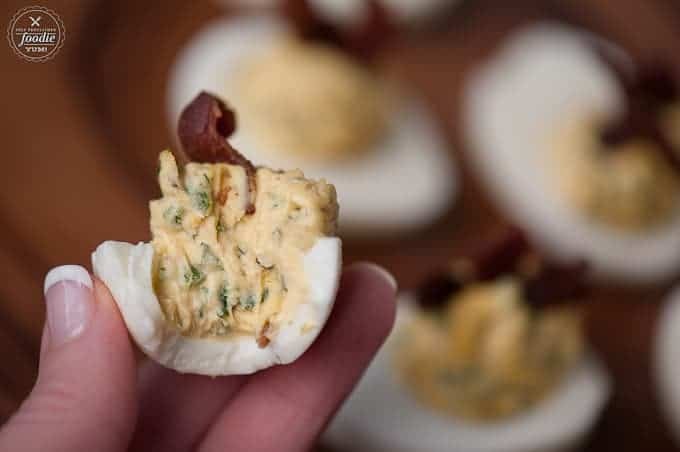 Plain deviled eggs are typically made with some mustard, but with that salty spicy combo of the bacon and jalapeno, I really didn’t think it needed it. The filling is full of teeny tiny bits of as much or as little bacon and jalapeno as you want. 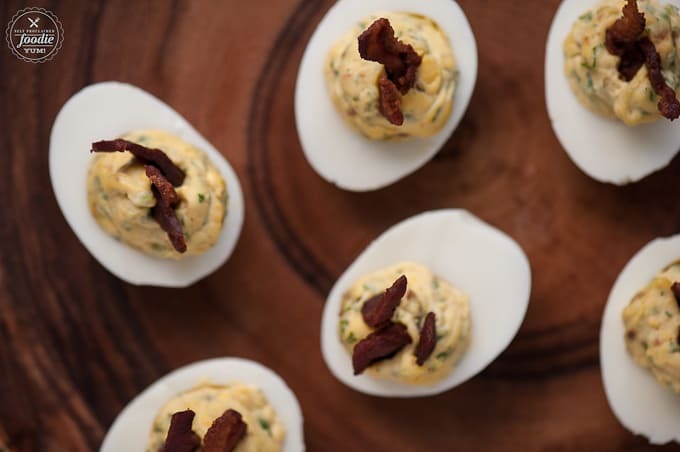 Its important to stick some larger pieces of the bacon on top because if people know there’s bacon in your deviled eggs, they will be devoured. If you don’t want to share them, feel free to hide the fact that they have bacon. 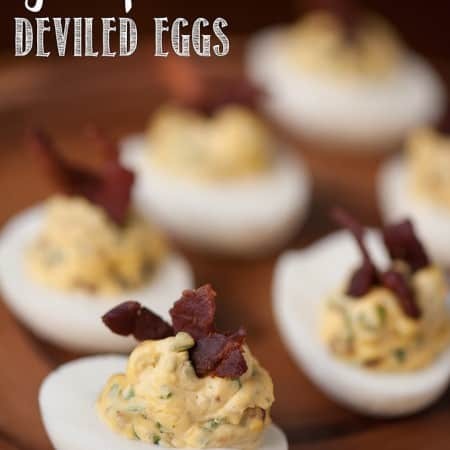 I’m not a huge deviled egg fan, myself, but these were exceptionally good. I won’t tell you how many I ate. Let’s just say it was enough to lead anyone to believe that my favorite food in the world is a deviled egg. Prepare hard boiled eggs. Chill. Remove shells. 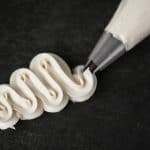 Use a sharp knife to slice in half lengthwise. Remove yolks and place in small bowl and take care not to tear egg white. Mash yolks with a fork. Add mayonnaise and stir well until creamy and smooth. 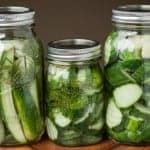 Remove stem, veins and seeds from jalapenos. Mince into tiny pieces. Stir into egg yolks. Prepare bacon ends and pieces until perfectly crisp. 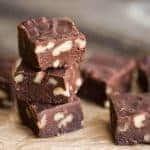 Take a handful of bacon and dice into tiny pieces, reserving some pieces to garnish the top and of course just to eat because everyone loves bacon. Add to the yolk and jalapeno mixture. Stir well to combine. This mixture doesn't pipe well through a small opening. I found the easiest way to get it into the egg is to add it to a small plastic bag, snip the corner, and squeeze the bag until you get the desired amount into each egg white. Top with additional pieces of bacon. Keep chilled. 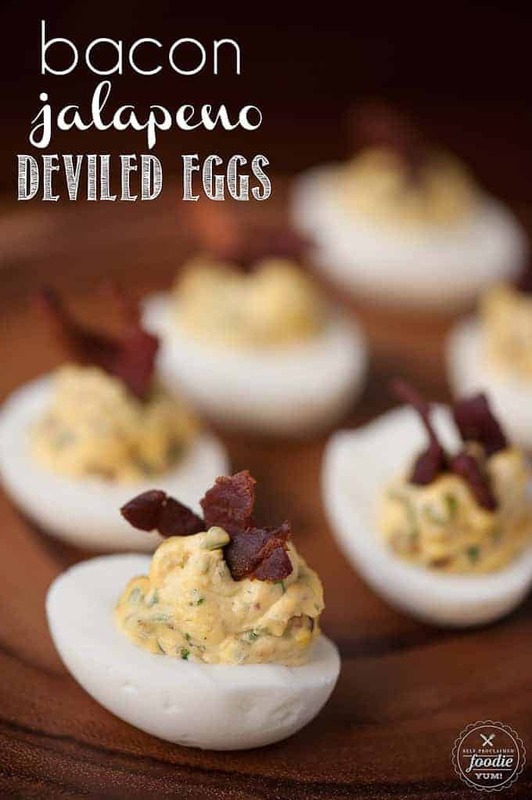 Love these deviled eggs, Krissy! Bacon and jalapeño always got well together. I found just what I was needed, and it was ennigtaitenr!